The first dengue death in the national Capital and the onset of viral fevers have brought back the focus on mosquito-checking and fogging measures by the civic bodies. The Shiromani Akali Dal (Badal) in a convention "Panthak Chetna" held today urged the Sikh community to throw away the Shiromani Akali Dal (Delhi) from the Delhi Sikh Gurdwara Management Committee in the coming election. 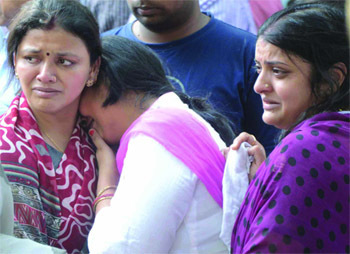 Relatives of the Delhi-based Agarwal family that died when their car crashed and caught fire on the NH2 (Mathura Road) at Palwal on Tuesday, after the cremation at the Nigam Bodh Ghat in New Delhi on Wednesday. (Below) The unfortunate family-- (LtoR) Ashok Agarwal, his wife Manju Agarwal, son Amit Agarwal,daughter-in-law Seema Agarwal and grandson Shobit. Tribune photos. Suspecting that the person who killed a schoolteacher at her house in Timarpur yesterday had a friendly entry, the police is questioning the caretaker of the house, Rajender Kumar. In all, 18 people have been questioned so far. A woman who allegedly hired killers to get her husband murdered has been arrested by the west district police, said senior officials today. The teachers' association of Indira Gandhi National Open University (IGNOU) went on a one-day pen-down strike today, protesting against the move of the Ministry of Union Human Resource Development (MHRD) to shift the Distance Education Council (DEC) of the varsity to the University Grants Commission. In a workshop being held in the national Capital for the first time ever, over 250 student volunteers at Jawaharlal Nehru University are gearing up to take participants on an hourlong ride into the world of a differently abled person. Kedar Nath Sahni (85), senior BJP leader and former Governor of Sikkim and Maharashtra, passed away today. He was admitted to Batra Hospital where he breathed his last. Sahni also served as the Mayor of Delhi, Chief Executive Councillor in Delhi, BJP president of Delhi State, All India BJP general secretary and convenor of Overseas Friends of the BJP. Doctors at Indian Spinal Injuries Centre (ISIC) here have performed a bilateral knee transplant on a 35-year-old haemophilia patient. While it took five days for the municipal corporation to record the death of a 12-year-old child who became the first victim this season at All India Institute of Medical Sciences, the three MCD units –South Delhi Municipal Corporation, East Delhi Municipal Corporation and North Delhi Municipal Corporation—have been proactive, as officials put it. “Our teams have been at work since May. We have been carrying out door-to-door checking. Fogging exercise is being done regularly. As of date, 450 people have been prosecuted during inspection,” said Dr N K Yadav of the health department of the South Delhi Municipal Corporation. Going by the official figures, the dengue cases this year have been less as compared to the previous years. Ten new cases have pushed the figure to 98 so far vis-à-vis 283 cases last year. In 2010 when dengue had reached epidemic proportions, there were 4,108 cases, including 24 from outside, and five deaths while the figures for 2009 were 29 cases and no deaths. In 2008, there were 550 dengue cases and two deaths. Of the total cases, south zone reported 16 while 13 cases each were seen from Civil Lines Central Zones and Karol Bagh and three patients are from outside the Capital. A total of 201 cases of malaria fever have been recorded compared to 199 cases last year. However, the current weather has led to a spurt in the viral cases, maintained both the government and private hospitals. A number of viral patients are being seen at AIIMS, Safdarjung Hospital, Lok Nayak Hospital and Guru Teg Bahadur (GTB) Hospital. The GTB medical superintendent, Dr Rajpal confirmed that 20 per cent patients at the emergency are suspected cases with a total of eight patients diagnosed with dengue till date. In view of the weather conditions that are conducive to the breeding of mosquitoes, Delhi Health Minister A K Walia issued directions to the hospitals to be ready and also instructed the civic units to intensify the fogging exercise. The main issues discussed in the convention were: education, Akal Takhat, Nanakshahi Calender, corruption in gurdwara affairs, Bala Sahib Hospital, Bangla Sahib Parking and RTI. The convention was attended by a large number of people. Addressing the gathering, Delhi unit chief of the SAD Badal, Manjit Singh GK said that the election was being delayed by the Delhi government as the ruling party had the "blessings of the city government". The government cannot afford Paramjit Singh Sarna's defeat before the Assembly election due to be held next year. SAD Badal youth leader Manjinder Singh Sirsa said that in the history of gurdwara committee, Sarna is the first leader against whom a case has been filed in connection with the gurdwara affairs. This is insulting to the entire community. Instead of being thrown by the people from the committee, Sarna himself should resign. The other speakers were Kuldeep Singh Bhogal, Onkar Singh Thapar and Avatar Singh Hit. 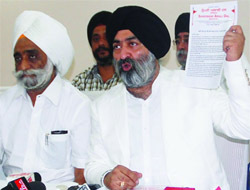 Whether Badal is sincere in making the base of his party strong in Delhi as there are already many groups in SAD Badal's Delhi unit, Manjit Singh said that the Deputy Chief Minister of Punjab, Sukhbir Singh Badal, at a recent meeting in Delhi had clearly indicated that groupism would not be tolerated and the party had to make efforts to come to power in the DSGMC. Sixty-two-year-old Madhu Mehra was a science teacher at Sarvodaya Kanya Bal Vidyalaya in Nehru Vihar. She also used to lend money to people and one of her debtors, Ashok Kumar, has been interrogated. "The killer will soon be in the police net. Several teams are working to solve the murder," said Sindhu Pillai, deputy commissioner of police (North). The house was not found ransacked, but the investigators are also probing the robbery angle, said the DCP. "Initial probe has concluded that the senior citizen was strangled with a pillow. There were no other visible injury marks on her body," the official added. Mehra was found dead at her house yesterday afternoon. She lived alone at a Delhi government flat in B-Block, Timarpur Teachers Colony. The incident came to light when Rajinder Kumar went to Mehra's house around 2.15 pm and found the main gate unlocked. When he went inside, he saw Mehra lying on the floor of the bedroom. According to Mehra's neighbours, she was a loner and did not mingle with anyone since the death of her husband and son. Her body was taken to the Sabzi Mandi mortuary for postmortem. Apart from the woman, Sangeeta (31), two persons-- Sushil Brar (30) and Bimal Kujur (27)-- have been arrested in connection with the murder of Manoj Barar (33) of Nihal Vihar, said V Renganathan, additional commissioner of police (West district). The Sangeeta was held yesterday while Sushil and Bimal were arrested this morning. Sushil and Bimal are rickshaw-pullers in Rajokri and hail from Jharkhand. Manoj Brar was found murdered at his house on Sunday night. His throat was slit and the body had multiple stab injuries. Sangeeta has disclosed that she got Manoj murdered as he had illicit relations with many women. "Sangeeta has claimed that whenever she objected to Manoj's illicit relationships, he would beat her brutally. She feared that one day he would get her murdered. So she made decided to kill him," said Renganathan. She had met Sushil and Bimal in Punjabi Bagh and hired them to murder Manoj. The two agreed to commit the murder for Rs 1.5 lakh. Before the murder, Sangeeta left Delhi for her in-laws' village in Jharkhand to escape suspicion. After reaching the village, she ordered Sushil and Bimal to execute the plan. Hundreds of teachers and academics assembled on campus and staged a dharna at the convention centre of the university. The decision was taken at a recent meeting of the university's management body, which also had the representatives from the MHRD. In the meeting, it was resolved that the agitation would be intensified to make the MHRD reverse its decision regarding shifting of the DEC from IGNOU to the UGC and annulment of Statute 28 of IGNOU Act. The Distance Education Council (DEC) was initially instituted under the IGNOU Act, 1985 so that IGNOU could nurture and develop the Online Distance Learning (ODL) system as an apex university. "On July 28, a management body meeting was held and the decision taken. Of the six members who had voting rights, four opposed the proposal of shifting the DEC to the UGC, saying it will not be in the interest of the ODL system in the country," said B S Saraswat, president of IGNOU teachers' association. The teachers' body had also staged a dharna against the decision earlier on Sept19. A letter was sent to the vice-chancellor, asking him not to accept the decision or succumb to pressure exerted by the government, Saraswat said. "This body has contributed to the development of distance learning education. Such high-handed behaviour and interference of the HRD ministry in the university's functioning amounts to infringement not only on the autonomy of the university, but also on the powers of Parliament," said Saraswat. The association members also questioned the existence of UGC as the prime recommendation body for higher education when the National Commission of Higher Education and Research Bill lies pending in Parliament. "If the Bill is passed, the powers of UGC will almost be dissolved. A separate regulatory body will be constituted by the government which will take all the academic decisions of the university," a member said. The three-day event beginning on October 4 will give the participants a chance to experience the life of a person suffering from disabilities (visual impairment in particular) through an hourlong workshop where they will walk blindfolded with a cane amongst several other stages set up with interactive games and innovative exercises to achieve their total score. "The score will determine the level of understanding and compatibility the participant has towards the differently abled. Compassion and understanding towards the differently abled not just at the student level, but even in a working atmosphere is very crucial. And that is what we are attempting to achieve," said the organizer Sandeep Singh from the Centre for English Studies at the university. Explaining further about the workshop, Sandeep who himself is visually challenged, said, "It is called Antarchakshu. It means the eye within. This is an attempt to provide an opportunity to the larger community not just to experience and explore the world of the disabled, but understand it; a world which is not all that different. To break down common myths among the participants so as to eliminate biases regarding blindness, is one of our main goals." Sandeep's batch-mate and co-organizer Wafa Hamid said, "We are expecting nearly 3,000 people from various fields. With the help of the university, we have invited representatives of various government bodies, including the Delhi Metro, Delhi University, the University Grants Commission (UGC), the Delhi Transport Corporation (DTC)." "Even if a minute section of the participants from government bodies get sensitized through this workshop, we will achieve our goal. During the last workshop in Mumbai, we noticed extreme reactions from people. Some of them even ended up crying by the time they finished the workshop," Sandeep added. The workshop will be held at the university's Convention Centre under the aegis of the Equal Opportunity Office and Xavier's Resource Centre for the Visually Challenged, Mumbai, and Saksham Trust of New Delhi. It is also being supported by the Union Ministry of Social Justice and Empowerment. The Delhi government has declared two days— Wednesday and Thursday—state mourning on the demise of Kedar Nath Sahni. All the government offices will be closed on Thursday till 2 pm to pay homage to the departed leader. Condoling the death of the veteran leader, Delhi Chief Minister Sheila Dikshit said that he was an able administrator. In haemophilia patients, single joint replacements are usually required owing to recurrent and prolonged bleeding in joints and muscles that can lead to permanent disability and even death, but it is for the first time that such a patient has undergone a bilateral total knee joint replacement, said Dr P S Gill, senior joint replacement surgeon at ISIC. “The patient had come in a bad condition and couldn’t even walk. Transplanting both the knees was important. After nearly two months, he is able to move now,” added Dr Gill.